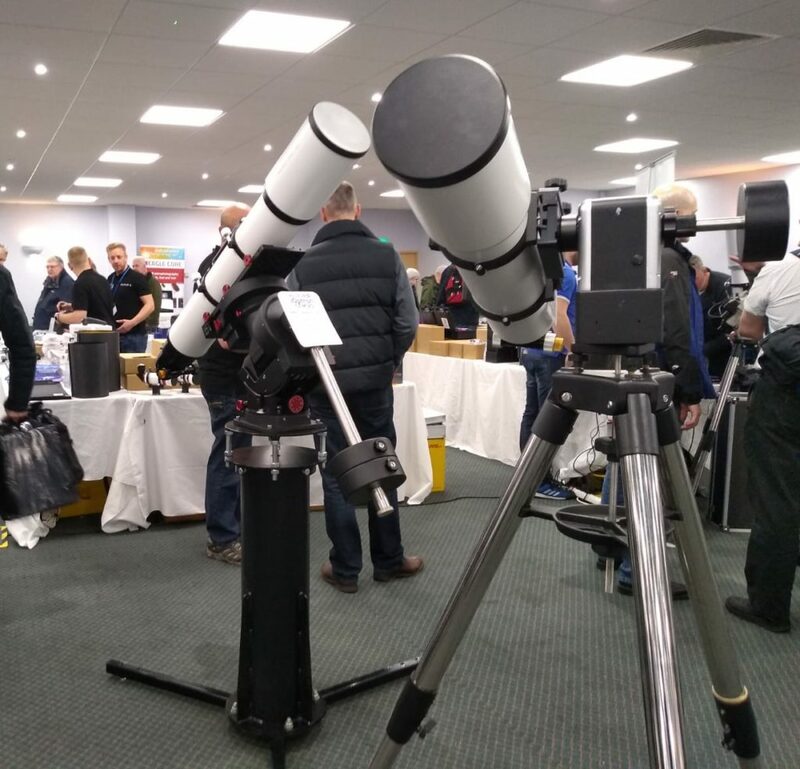 Lawrence, GingerGeek, Tim and I ( Dave Shave-Wall) along with BAS member Mil Dave attended the most excellent exhibition The Practical Astronomy Show in Kettering this last weekend. Lawrence did a sterling job of driving us thee and back in his cavernous Range Rover for the 2 hour trip each way from Basingstoke so many thanks to him. On arriving around 10am at the event we were greeted by 3 rooms of dealers showing there wears. 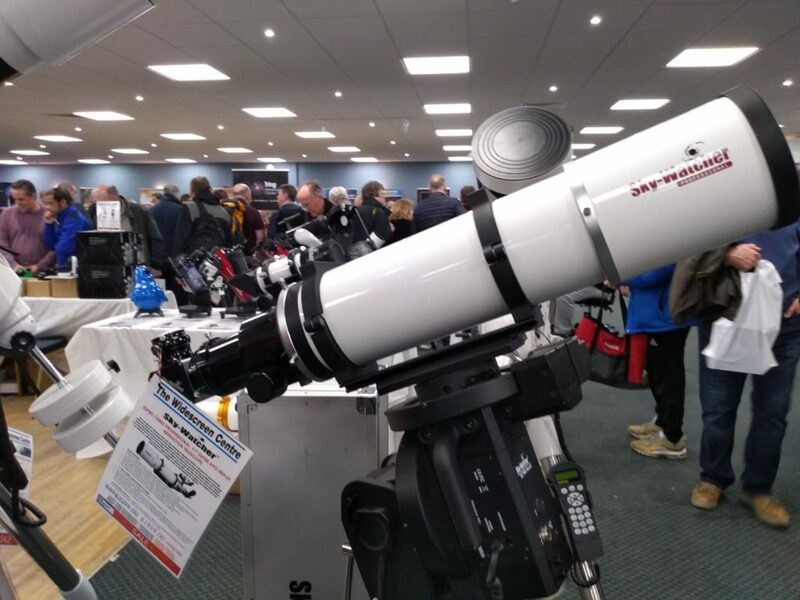 In the first instance we bumped into Steve Collingwood from Pulsar Observatories and his lovely 2.2m white dome on display. We had great chat given I have the 2.7m dome being fitted in a couple of weeks time. The dome was great and it was good to see in the flesh again and look at the drive motors. As always Steve was very knowledgable about the dome and it’s manufacture and performance. I can’t wait! 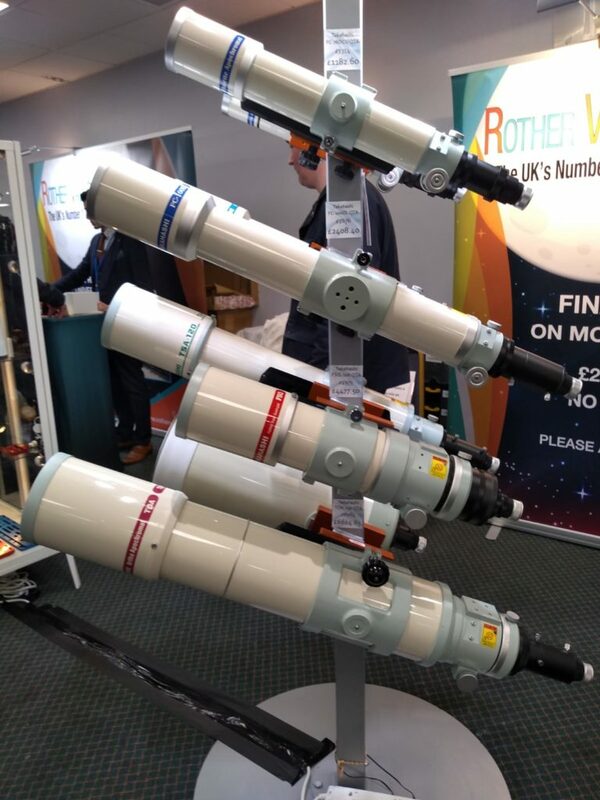 There were loads of scopes on display and as the day wore on it continued to amaze me just how many scopes and accessories one can find to look at and inspect for purchase. We stumbled across a couple of iOptron mounts including their new large CEM120 on the left in the photo above which was just beautiful. 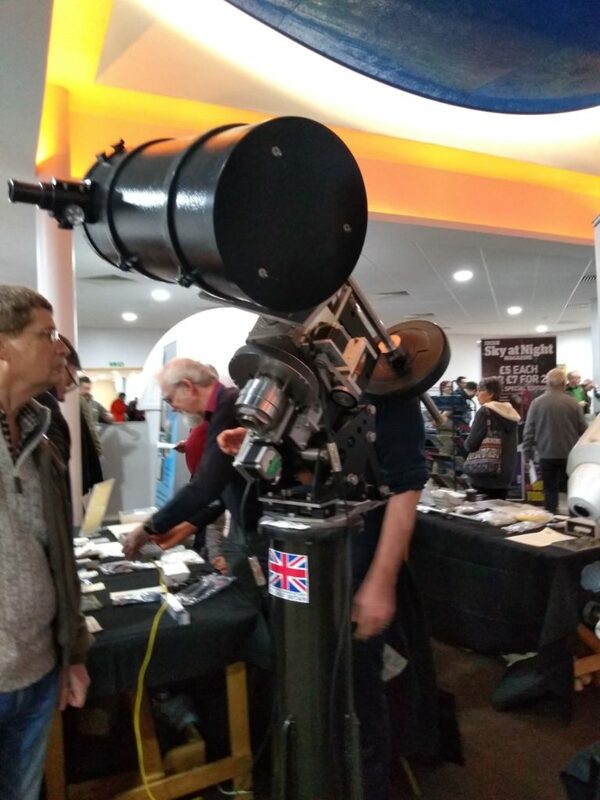 Skywatcher had a range of scopes on different dealers stands and again it was nice to see a couple of copes used by members of BASEG and BAS like the 150 and 120 Esprit refractors that perform superbly. 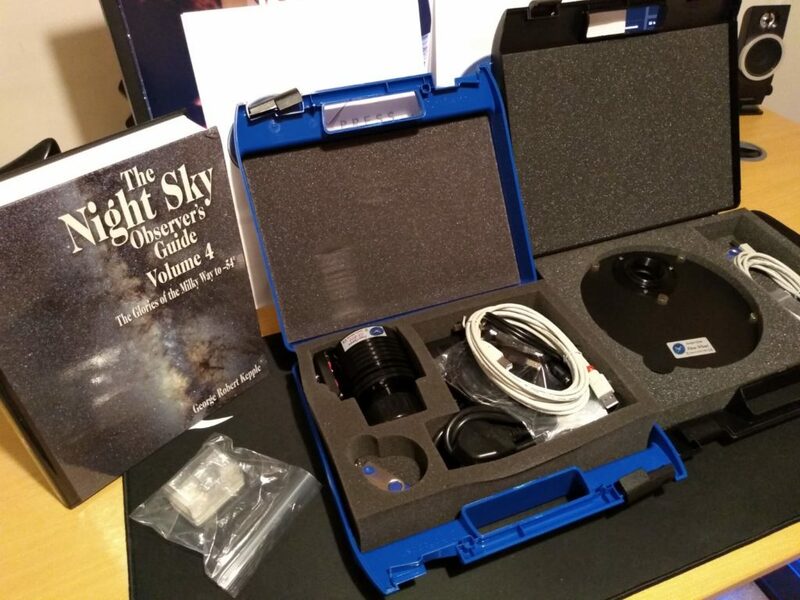 GingerGeek made some purchases including the very hand and well written and must have Night Sky Observers Guide V4 for the Milkyway, along with his new StarlightXpress camera and filter wheel. And any show would not be complete without a stand full of Taks and I wonder if this stand has more Taks than our ver own Bob? We also spoke to a friend of GingerGeek’s who makes his own Corrected Dall Kirkham open truss OTAs which looked very well build and would tempt me if I had not already bought one. The day would not have been complete without the talks, we all attended a few talks which were free as was the entry to the show and the parking! The talks were good and I went to one delivered by the writer of SharpCap who delivered an excellent talk on imaging times and settings. 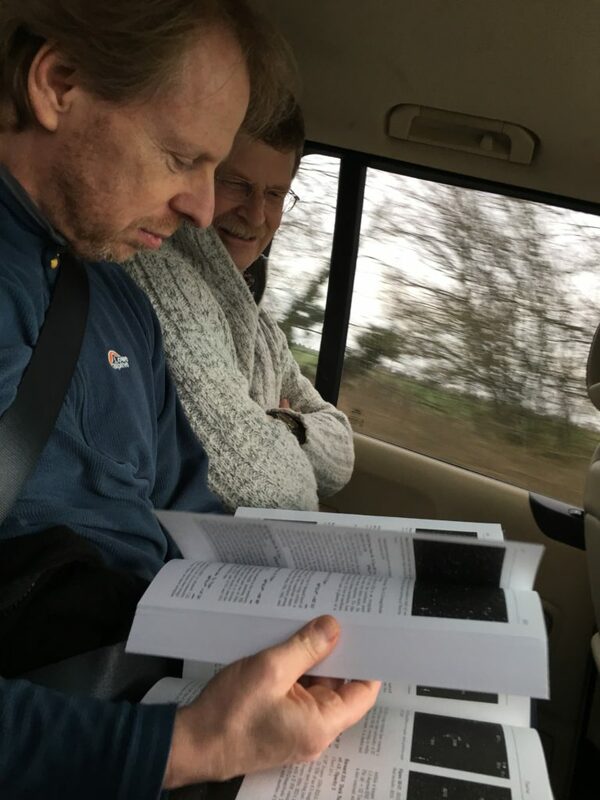 Finally the trip back was still great as GingerGeek thumbs through his copy of NSOG a bargain for anyone from the Webdeepsky society. 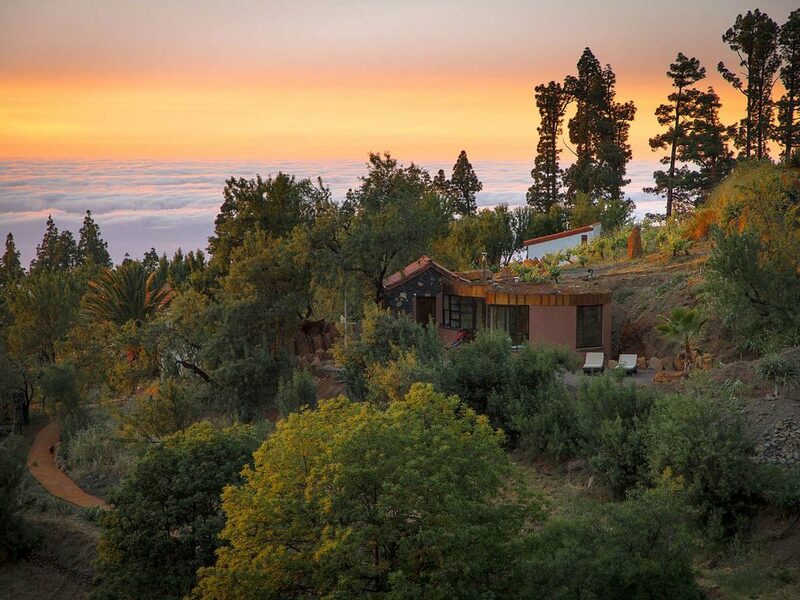 Hacienda is a group of 5 villas on the North West of the island of La Palma in the Canaries. At 4,333ft owned by Thomas Frietag. At this height you are sandwiched between two inversion layers meaning that a large number of nights tend to be clear at around 240 per year. Having just completed our first trip to one of the villas I can attest to all the nights we stayed being clear and the seeing excellent. Given this is the beginning of November it bodes well for the rest off the year. Calima. As always with the Canary islands you do have a risk of calima, Sahara sand high in the atmosphere, when you travel to all the islands. 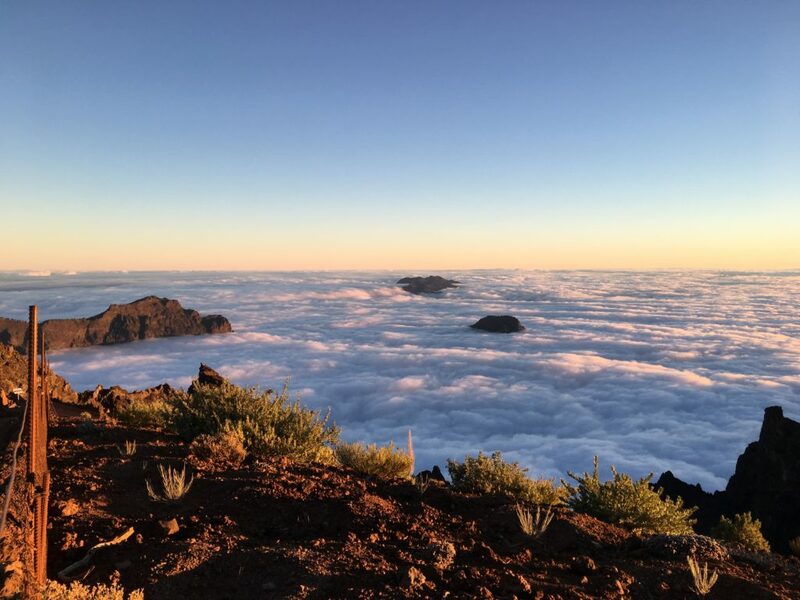 The dust tends to be more prevalent in the summer months when you are afforded less clouds, whilst during the winter there is much less chance of calima but an increased chance of cloud. On arrival for myself and my society friend Alan Lorrain the calima was slightly present when we arrived, however it only interfered with wide field stars cape astrophotography, not at all for visual and hardly at all for deep sky astrophotography. It cleared by night 4 on this particular trip, so we were happy with this as a result. 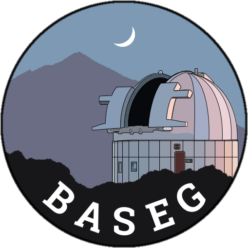 Location is everything and needs to be balanced with cost, suitability for all astronomers and other activities that one might want to partake in whilst there. This expedition was made up of two astronomers and we both have a passion fo hiking along with astrophotography and visual. We had heard that the North West of the island was a good compromise for not driving up and down the mountain each night and observing by the roadside, but still being clear enough to perform astronomy. Whilst the nights were indeed clear, the days tended to be clouded and foggy where the cloud would form and come up and engulf the finca. That said, with clockwork precision the cloud would descend to a low altitude by 6:30pm allowing a full view of the night sky. Lighting pollution is an essential factor in any trip and Christian who looked after us during our stay was very accommodating. Whilst there were lights around the pool, along the path and by the water fountain, Christian kindly changed the timer to turn these off for us at 9pm each night. This single act plunged us into total darkness each evening allowing light free access to the heavens above. So what was the accommodation like? Well we stayed in the villa El Sitio. Built into the rock face itself this beautifully sculpted villa was a balance of function and art. Individual artwork adorned the walls along with a wide us of copper through the building creating a warm homely feeling especially at sunset. 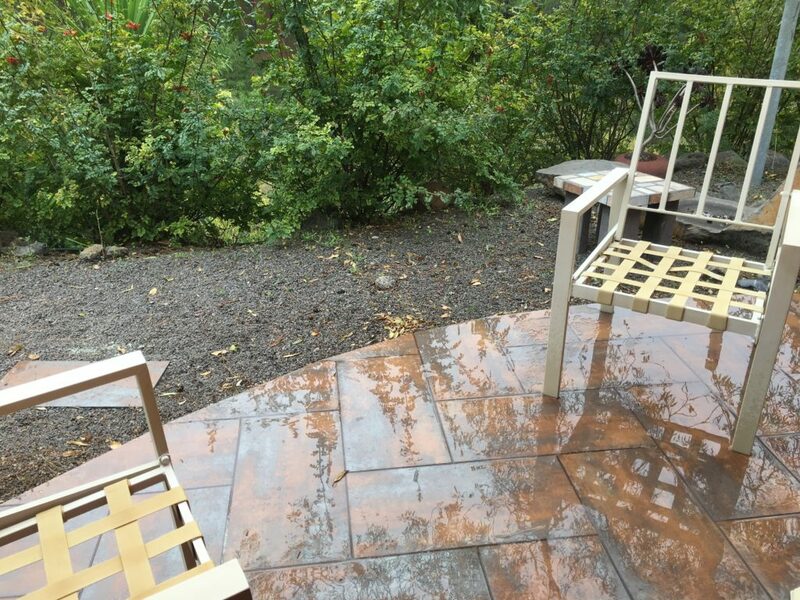 The tranquility of the site and accommodation would be hard to match if you enjoy quiet and seclusion. 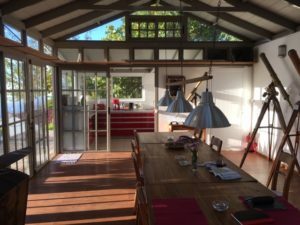 the functionality of the accommodation provided a double bed in the bedroom and a sofa bed in the lounge/kitchen area which suited us fine. There were showers inside and out, a sauna (although we did not use it) lovely kitchen, dinning area inside and dinning area outside. Observing areas were many at this property. 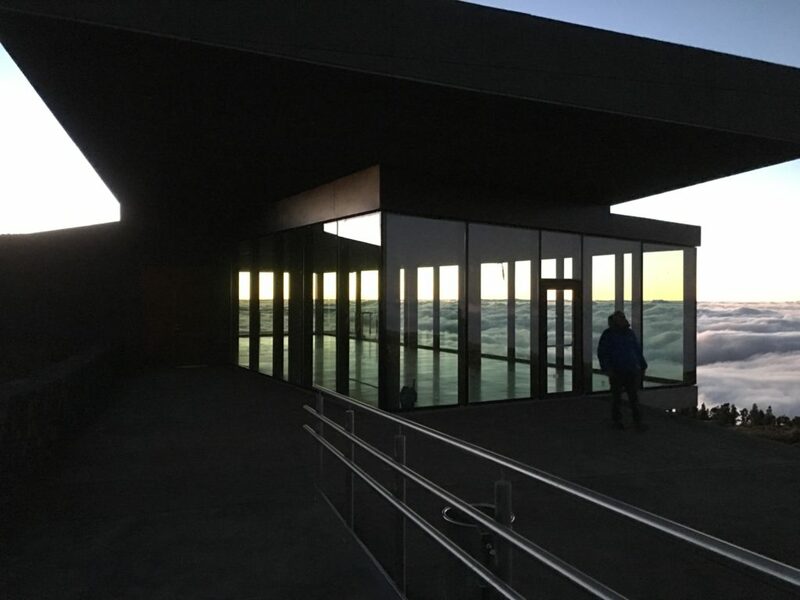 I observed from outside the main bedroom for three evenings, three times from by the pool area and a single time from the top of the mountain and the new but unfinished visitors centre. Each location has its own merits in terms of horizon, humidity or access. Inn terms of humidity there was a lot of dew most evenings at this altitude, something that is a tradeoff with driving the 25 minutes up the mountain to the visitors centre. Overall it has to be said this was a lovely astronomy holiday intersecting with hiking. We both enjoyed our 3-6 hours observing but also waking early enough to take in the refreshing walks on offer. 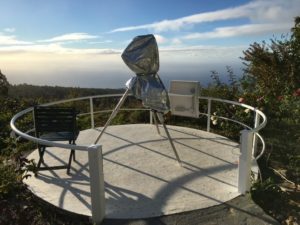 After observing at the side of the road all night at the top of La Palma and Tenerife, observing from the MONS telescope and travelling down to the H!0 near both Santa Cruz in La Palma and Puerto de la Cruz in Tenerife, this has to be the best compromise of them all and I would thoroughly recommend it. 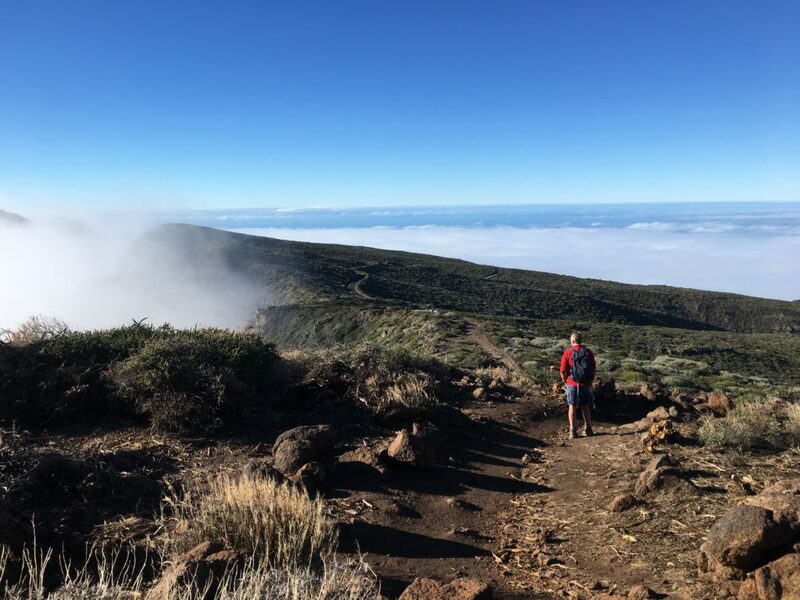 Situated in Las Tricias, in the region of Garafia on the western side of La Palma is the Athos Star camp. 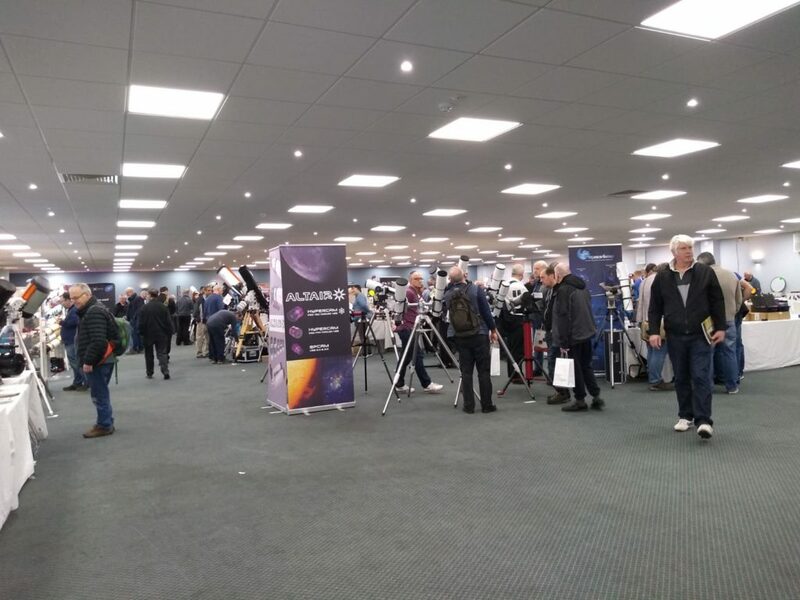 Occupying the site of a former botanical gardens the 45,000 square metre site has now been converted to a magnet for astronomers from across Europe. As Dave and I were already staying at a villa nearby we contacted Kai, the owner, to arrange a visit to the camp to check out the location and the facilities. Dave had previously marked the camp on Google Maps but when we were told to turn down a little track off the LP1 we declined, remaining on the main road for another couple of kilometres (and loads of bends) we reached Las Tricias village and turned up an equally tiny track and proceeded to wind our way back up the hillside, eventually arriving at the gate of the facility. Kai greeted us and invited us into the Office, where you start to get an idea of the kit that he has available, filter wheels, narrow band filters, cameras and of course loads of scopes and mounts! After a quick chat we joined him on a tour of the site. First light at the site was only in 2016. 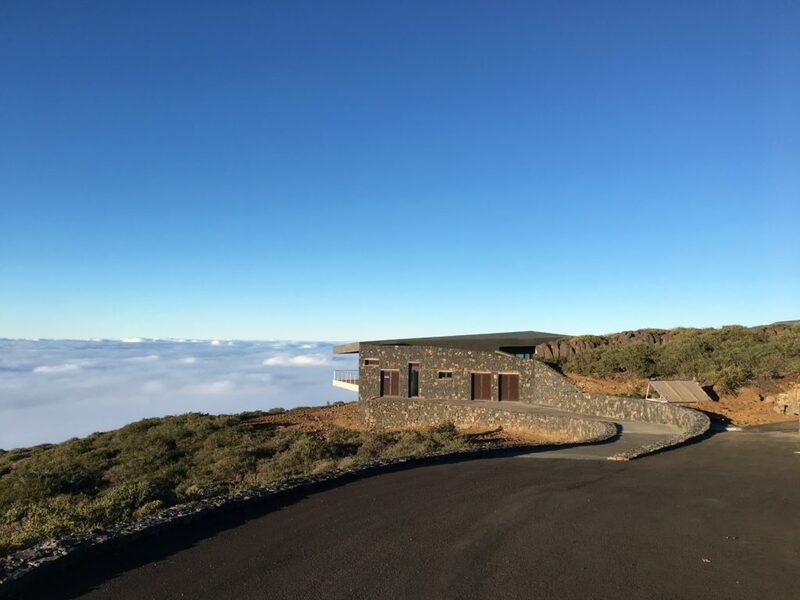 This followed a four year search to find somewhere suitable and the area seems to have its own micro climate, with it is claimed, about 300 clear nights a year, due to it being between the two inversion layers of cloud at 900 metres. The site has five separate villas, with accompanying observing space, and four of these are round the central area whose hub is the ‘Orangery’ which is a library/meeting area where guests can mingle both during the day and also between observing sessions at night. One villa is completely self-contained, and could sleep 3 but only has one observation pad. The other four villas have separate bathrooms but share the cooking facilities in the Orangery. The Villa rooms are (apart from one) twin occupancy, and the price quoted is for the room; i.e. could be divided in two if shared. Cost in the region of Euros ~400 for 5 nights plus extra nights at Euro ~70. From the astronomy side each observing pad has a concrete base with surrounding railing, which feature innovative tables (with power sockets) that can be moved to different locations around the rail. This enables the use of a laptop for telescope control or a red light for drawing. The list of equipment for hire is extensive, with a capital E! There is no obligation to hire and the choice for each individual will be based on whether they want to bring their own kit out from the UK with which they are familiar or to rent for example an EQ6 mount for 6 nights, thus removing the need to have an extra case on the plane and the cost that that involves. 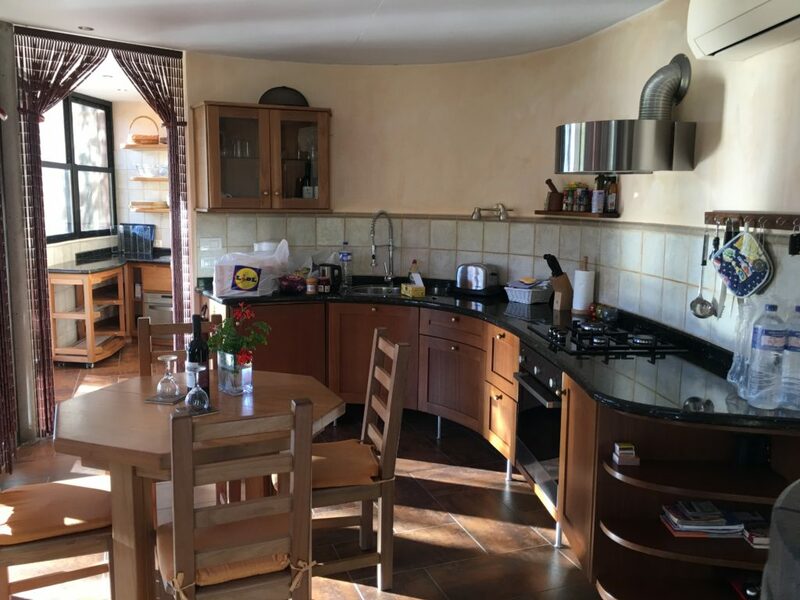 So on a preliminary basis the site offers self-catering facilities at a reasonable cost without the need to cart heavy items out from home. However Athos offers much much more. If you have dreamed of using a 25” Dob, there’s one for hire. Narrow band filters, CCD cameras, Dobs, SCTs and a range of refractors are all available. 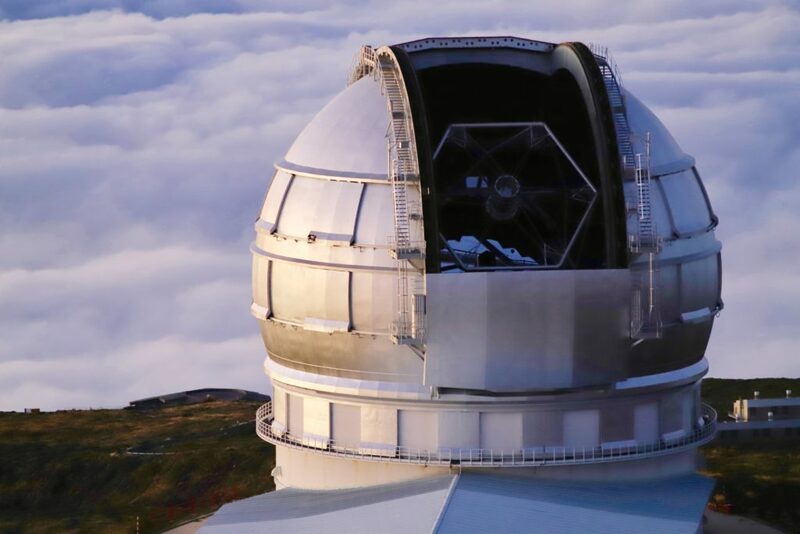 There is also a fully fitted observatory equipped with a C11 and a 7” refactor, dual mounted and operated from the control room below. Yes it will set you back Euros 290 per night, but for one night split 3 ways maybe affordable as a treat? Availability around new Moon is of course a little difficult necessitating booking into later 2019 or even into 2020 in order to get your chosen time and all 5 villas available. 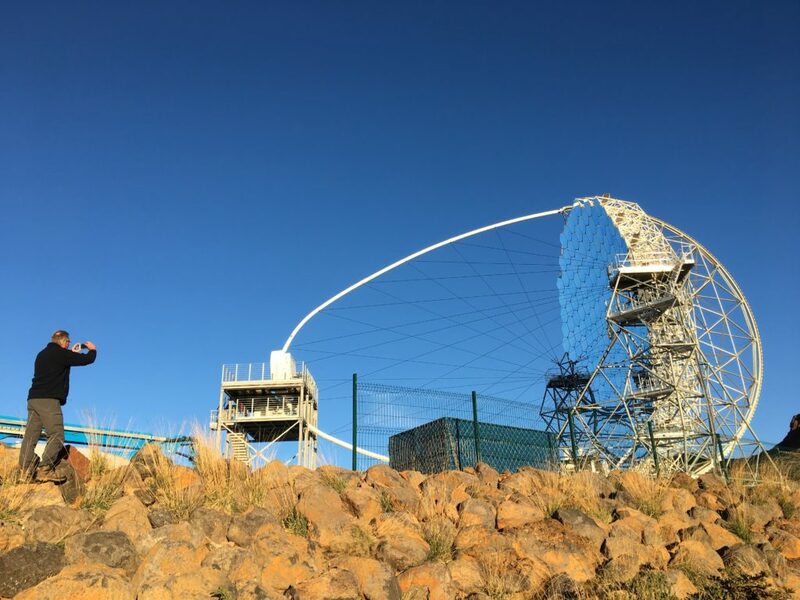 In conclusion superb facilities well worthy of consideration for amateur astronomers looking for clear skies, equipment hire and the chance to go individually or as a group. With my trusty Night Sky Observers Guide (NSOG) Vol 1 at hand and some planning done during the day I head out for what appears to be yet another clear night. 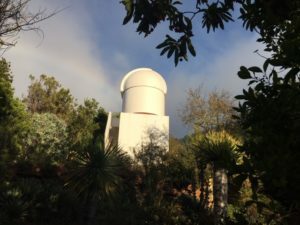 At 4,333 ft in the Hacienda villa complex (28°46’12.6″N 17°55’57.6″W – 28.770177, -17.932679) this week has been cloudy during the day (you are in the cloud) but clear every single night. We have had slight Calima when we arrived however for the past 2 nights the dust has been blown away by the westerly wind. 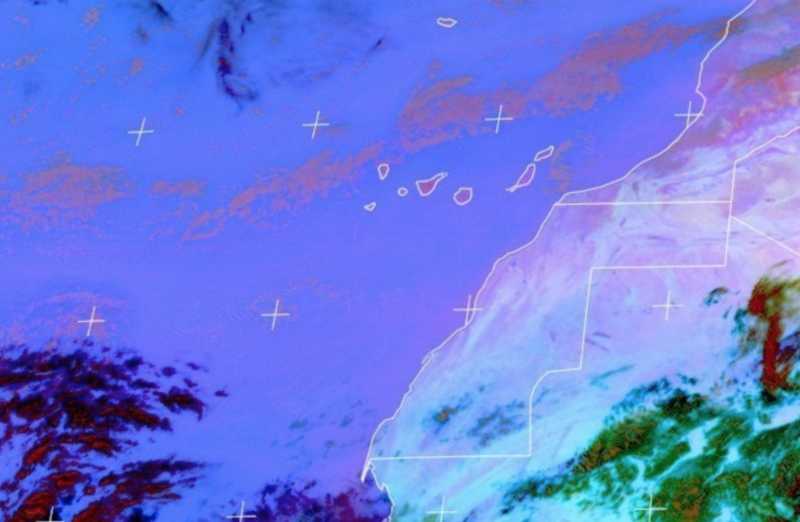 The above image is from the previous night and as you can see the Calima was just off the North of the island. A few comments on the NSOG before I continue. I mentioned previously I purchased from the Web Society, for which I am truly grateful. I like to think of the book as and advanced version of Turn Left at Orion but for the more serious astronomer. 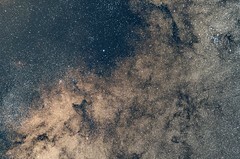 As an astronomer who likes both astrophotography and visual the book can be used for either. 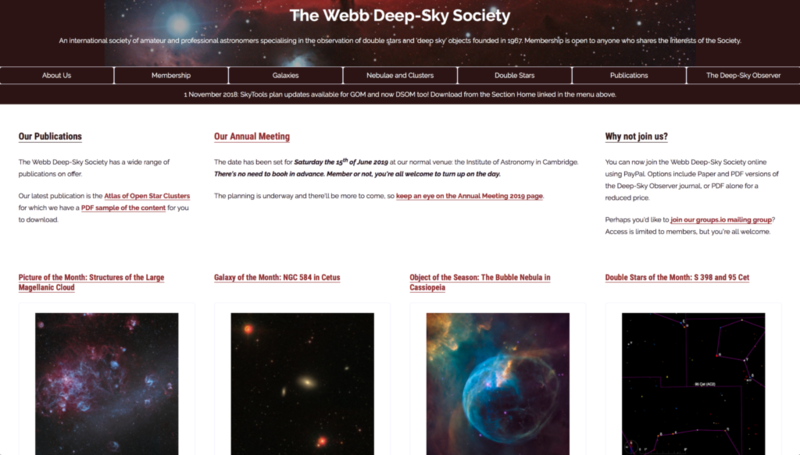 In the same way the Deep-Sky Observer magazine from the Webb Deep-Sky Society which I have now read 3 issues of has also inspired me to look for new objects, discover new catalogues and record my observations for myself and others. So what did I look at tonight ? NGC 1662 – This open cluster in Orion can be found at the top of his shield. I used the double star Pi1 Orionis to locate the right area and then looked through the 100mm Altair binos. A small scattering of stars and the more prominent making the cluster look like a capital E. Very pretty and an easy find for my first object this evening. Delta Orionis – Still observing in Orion from the other night I returned to take another look at this variable double star also known as Mintaka. Recalling I had used yesterday during some star hoping and being part of the open cluster Cr 7, the primary component is about Mag +2 and the smaller secondary Mag +6. Enif – After another read of Sky and Telescope this month they had a writeup of double stars which in the past have been a passing interest of mine. Since I had these excellent binoculars on their APM tripod, which by the way is superbly designed, I thought taking in some of these objects would be fun. Enif, also known as Epsilon Pegasi is a 2nd magnitude star representing the front of the horses head. 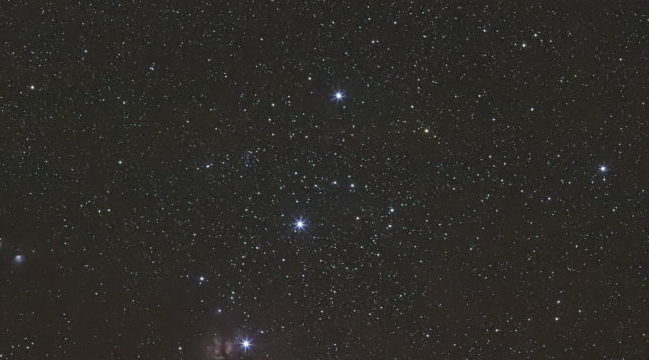 Epsilon peg is also called the pendulum star, for the simple reason if you look at it through a pair of binos or through a small telescope and then move it up and down with the double being on the left and right the brighter component moves first and then the dimmer component has a lag and finally races to catch up. A simple example of how the brain works but moving the binos in my case, up and down multiple stars makes the stars into a pendulum. Very nice indeed. 61 CYC – At the midnight hour I went in search of the piazza’s flying star, a fast moving binary system sweeping across the heavens at a rate of 5″ per year. That may not seem a lot until you realise that all the other stars in the vicinity don’t move visibly to us but this one does. The double red Mag +5 and +6 pair were easily seen in the binos and were a delightful sight indeed. NGC 6833 – @00:16 I observed this open cluster in Cygnus, a large tightly packed cluster of star, however slightly dim to my eyes. NGC 6826 – This ‘blinking’ planetary nebula in Cygnus is really good to look at through any size scope. Whilst in my giant binos it was not terribly large and extremely dim, it did indeed blink when you look at it then look away. Neptune – By 00:46 it was time to hunt down the large outer gas planet Neptune. Alan and I observed this through both the 6” and the binos, again it was brighter in the 4″ binos than the 6″ reflector but clearly in the binos had a blue tinge to it. 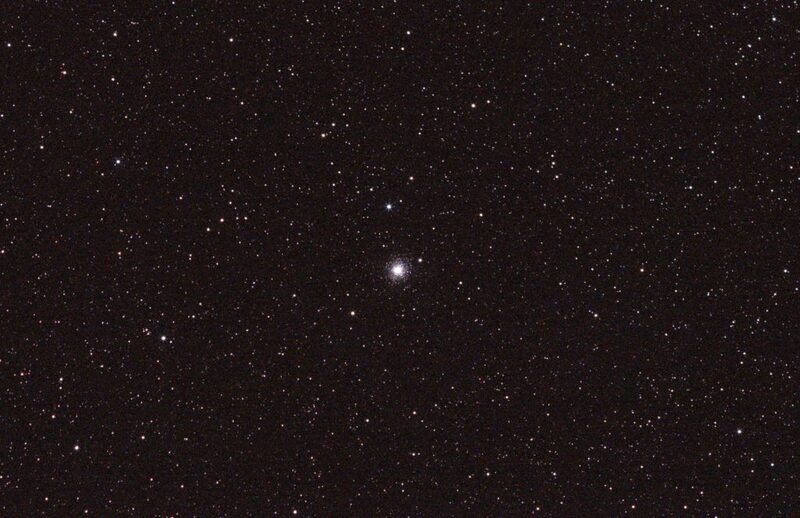 Algol – Now it was 01:00 and I moved to Perseus to measure the magnitude of Algol. This star dims from +2.1 to +3.4 every 2 days, 20 hours and 49 mins for a 10 hour long partial eclipse. On our first night I had measured the stars magnitude by comparing against gamma Andromeda (Almach) and as expected both are indeed +2.1. Tonight I compared to Epsilon Persei (Adid Australis) which is a magnitude +2.9 star and then compared back to Almach and you could notice the difference, Algol was very much the same magnitude as Adid Australis tonight. NGC 2175 – This open cluster in Orion shows a lightly scattered cluster which is very obvious to see and has a straight set of 3 stars running N-S towards the top of the FoV. NGC 2169 – Another open cluster in Orion, this time a smaller cluster with a little triangle of stars and 3 stars above on diagonal. 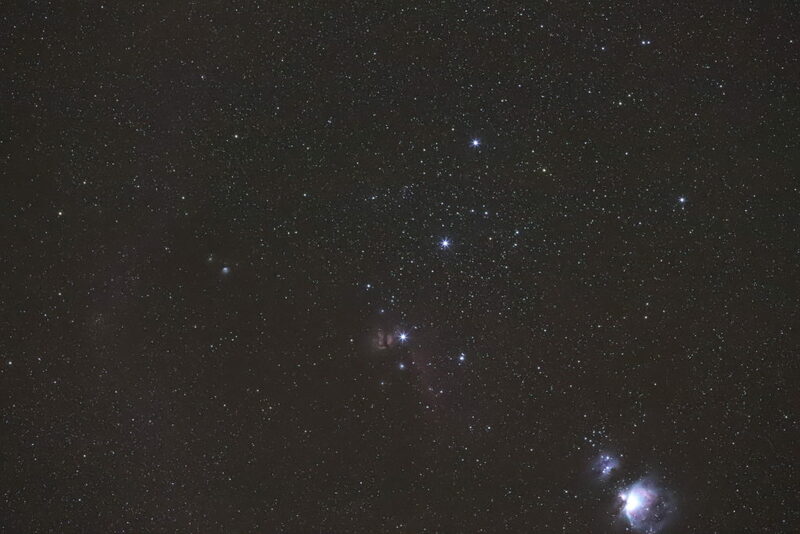 The star 70 Orionis is very bright down in the bottom left of the FoV with 67 Orionis in the top left. 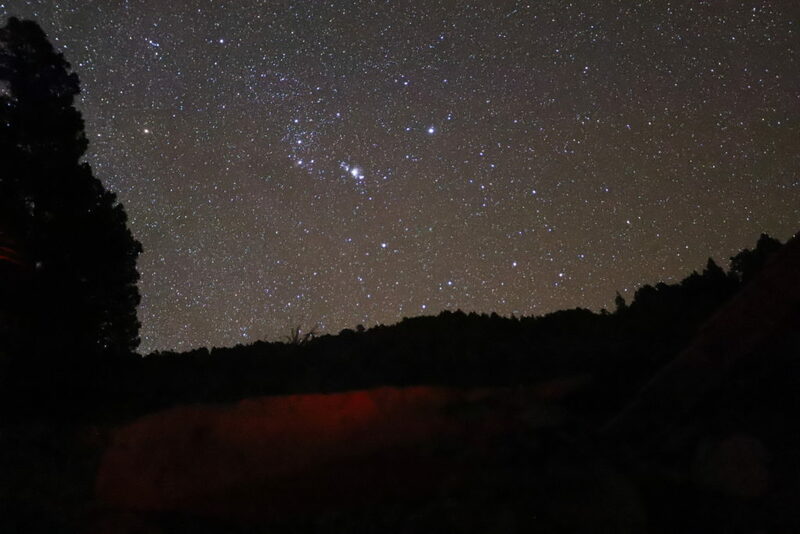 NGC 2244 – Nearing the end of night for me as we are going trekking each day on the mountain. So at 01:07 I took a look at the open cluster in the Rosette emission nebula. It appeared very bright in the field of view and is also a very pretty cluster. There was no emission nebular seen, again not surprising with 4″ binos. NGC 2264 – This is the Christmas Tree Cluster. Very easy to find at the horn of Monocerous and embedded in the centre of it is the naked eye star 15 Monocerotis which makes it easier to find. It should be noted that as a keen astrophotographer this trip has been really hard, I mean really hard. 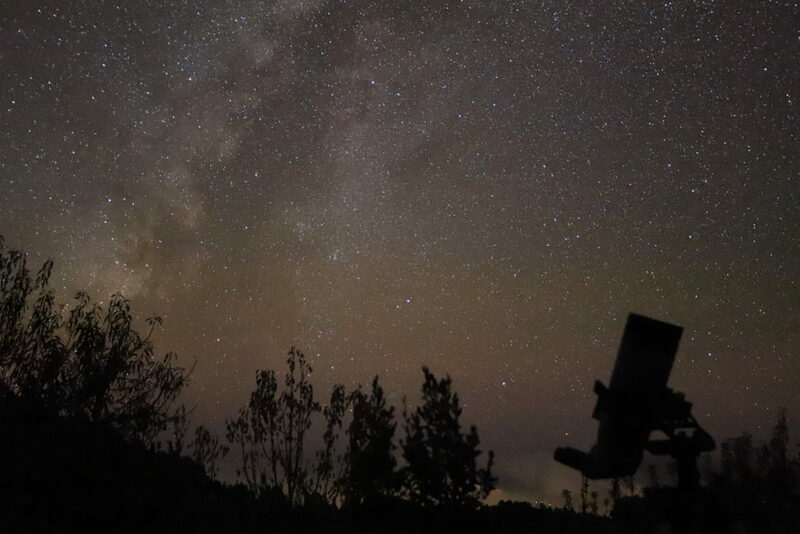 Under the majesty of the night sky at 4,333 ft with absolutely no light pollution whatsoever for 100s of miles and an SQM reading of nearly 22 and seeing of less about 1 arc minute, one wishes they had a camera and refractor to capture the moment forever………. Well, it would seem that I was wrong. Although I dearly do wish I had a refractor and a camera, I have been hugely impressed with the awe I have felt looking up at the night sky through my 4″ giant binos and really seeing the night sky with the MkI eyeball. There is nothing, no photos, no reading, no watching TV that can prepare you for the a personal connection with the universe, and that will stay with you forever. So out I went under the ever so bright milky way, Cygnus overhead, Sagittarius setting and the ever present Great Square of Pegasus. But it was none of these I was interested in this evening, after reading an article in the US Astronomy magazine, it was Orion that would catch my eye and eleven thirty PM was just about when Betelgeuse was clearing the tree line to the East. Collinder 65 – First it is useful to note that Collinder (Cr) is a catalogue of 471 open clusters by the Swedish astronomer Per Collinder. This particular entry is located above the head of Orion and is a vast 2 degrees across, so completely fills the FoV of my 100mm giant Altair binos. Whilst visible with the naked eye, the binos reveal a dispersed bunch of stars and double stars, a very pretty cluster to start the evening with. M1 – Okay so the sharp ones amongst you will realise that both Cr 65 and the Crab Nebula are actually in Taurus which is adjacent to Orion so please excuse the diversion as we cross the board. At 00:35 I viewed this object after imaging many times in broadband and narrow band. I have also seen through a 24″ dob in the UK. However the detail seen at this elevation with the binos was quiet remarkable. I could make out with averted vision (AV) structure coming and going within this supernova remnant. Collinder 69 – I had to pick an object to draw, so this was it for me. 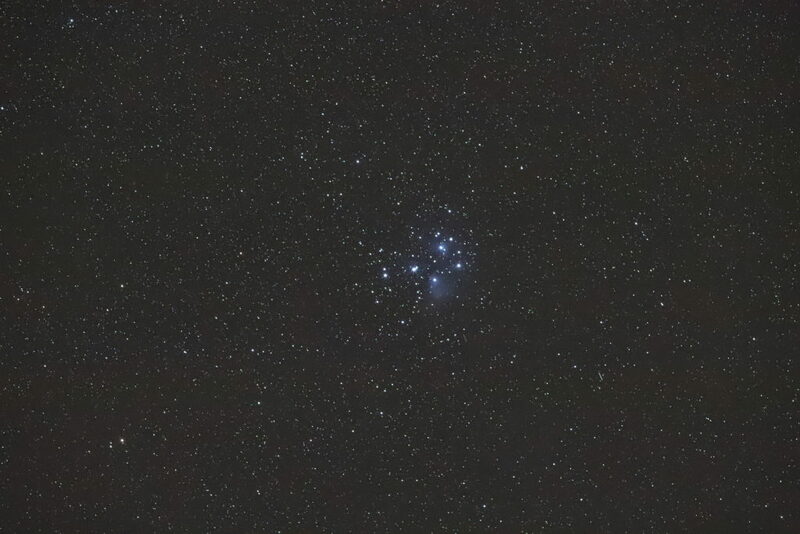 This beautiful naked eye cluster at the very head of Orion, seen @23:25 and drawn until 23:45. However I could not see the emission nebula surrounding it that is part of Sharpness catalogue through my binos. NGC 1981 – This distinct cluster of 9-10 stars forms an open cluster next to Running Man nebula. Fairly bland but you can tell it is a cluster. NGC 1980 – A small open cluster next to the back of M42 with 2 bright double stars and 2 dimmer double stars above and a single bright star near the centre The cluster is about 30 stars, some nebulosity can be seen surrounding it. M42 – Whilst I have seen this on other nights, the clarity of seeing tonight as the slight claim has moved away has afforded me the ability to actually seen the structure granulation within M42 which I have never experienced. Had I practiced my drawing more I would have sketched it, it kept me captivate for a full 15mins. M43 – In comparison to the Orion nebula this is not very bright and thus not very interesting and slightly overshadowed by the Great Orion Nebula. Collinder 70 – At 23:54 I moved to observe the 3 main belt stars in Orion. Collectively you may be surprised to hear they are actually an open cluster and there are so many stars here it takes a while to sweep through even with my 1.7 degree FoV. In total there are over 100 stars that make up the cluster with the right most star seemingly a double. M78 – When I was panning around left star of belt I again fortuitously stumbled across what looked like 2 stars within a diffuse nebula to the south with a straight edge to the North. It was very prominent and grabbed my attention as did the next object in the FoV with it NGC 7071. NGC 2071 – Being right next to M78 I could see a nebula surrounding it with AV but also with direct vision DV. Small but obvious in the FoV. NGC 2024 – The Flame Nebula looks like two bands of nebula with a gap in between through the binos, instantly obvious to me however Alan who had wondered over periodically throughout the night could not see it. Given again I have imaged it was fascination to see visually. NGC 2023 – The nebula around a star next to main star Alnitak is diffuse and can be seen with AV. IC434 – Better know as the Horse Head Nebula, it is visible next to the Flame above and can be seen with DV. Only the northern most portion can be seen but not the horse head with this small set of binos. Sigma Orionis – To finish this evenings visual fest I took a look at a this multiple star system. I could split the 3 stars including HIP 26551 and HIP 1932very easily in the binos. At this point my back was aching as it was now around 02:30. I decided to head inside for a break and then come back out with the Canon 6D MKII along with Alan’s 200mm lens and perform some more star tests. Some of the raw single images have been included above. Additionally I wanted to bag the comet I had seen a few nights ago visually, namely 38P/Stephan-Oterma. You can just make it out here and if you were to have the full resolution image you could see the Eskimo Nebula too. Alan’s photo using his 71mm Williams Optics refractor is far better as I only had the 200mm lens. Last on my list for the night, rather opportunistically I took a quick image of M45 that again I viewed the other night. Here is a single 10s image. At around 03:30 I was tired and Alan and I agreed we had achieved enough tonight and would retire the 10 feet to our respective beds, much better than driving 1 hour down a mountain I can assure you. 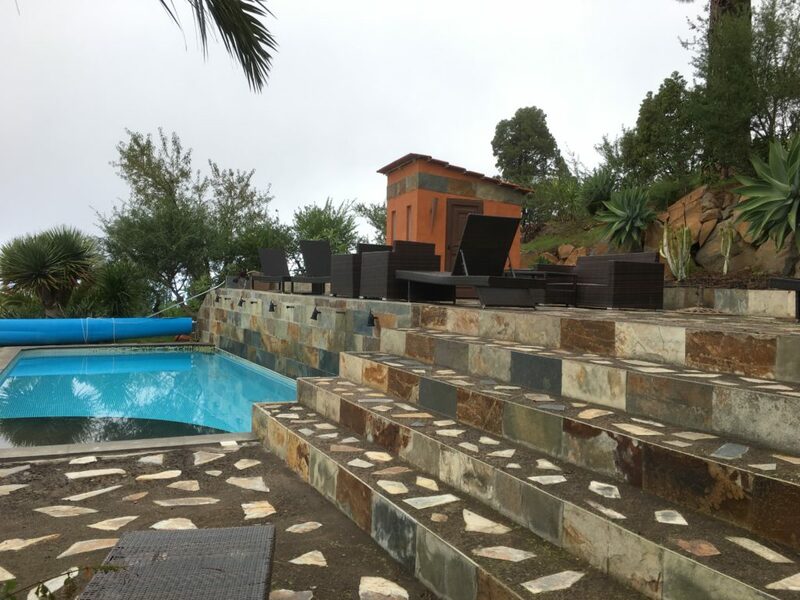 It should be noted that unlike previous trips where we observe all night long then drive down the mountain, we are afforded the luxury of observing from the villa. This means that not only we get some sleep, but also we get to partake in the other part of our trip, trekking through forests and across the mountain during the day. M15 – At 21:23, I found this beautiful globular cluster, located in Pegasus both through the 100mm binos and the 10” dob. 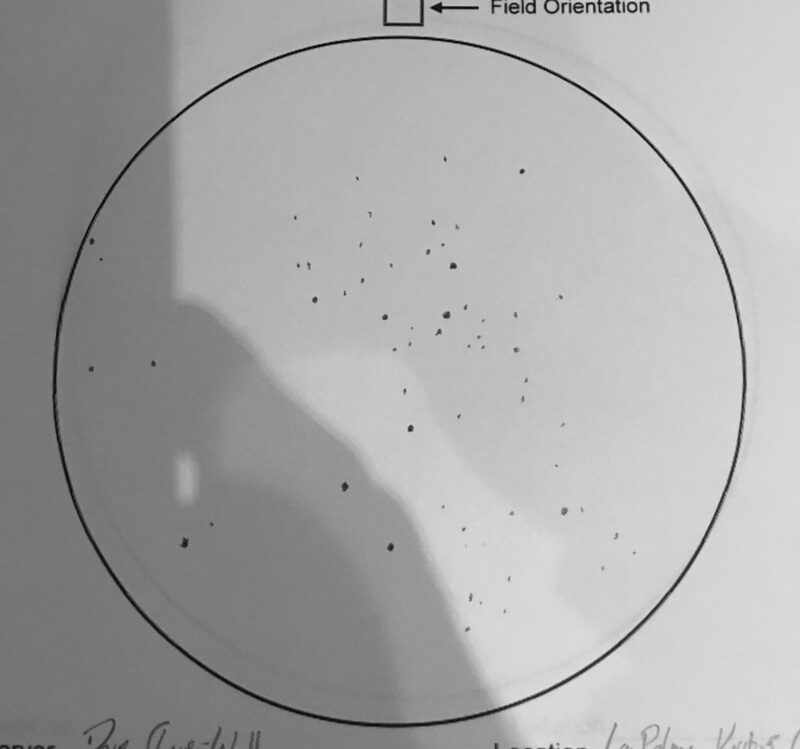 In the dob you can see the many diamonds of stars, in the Binos you see a small fuzzy shape with direct vision (DV) and a larger fuzzy ball with averted vision (AV). Alan took a photo with the modified Canon 650D provided by member Paul Cabrelli with the 200mm lens. 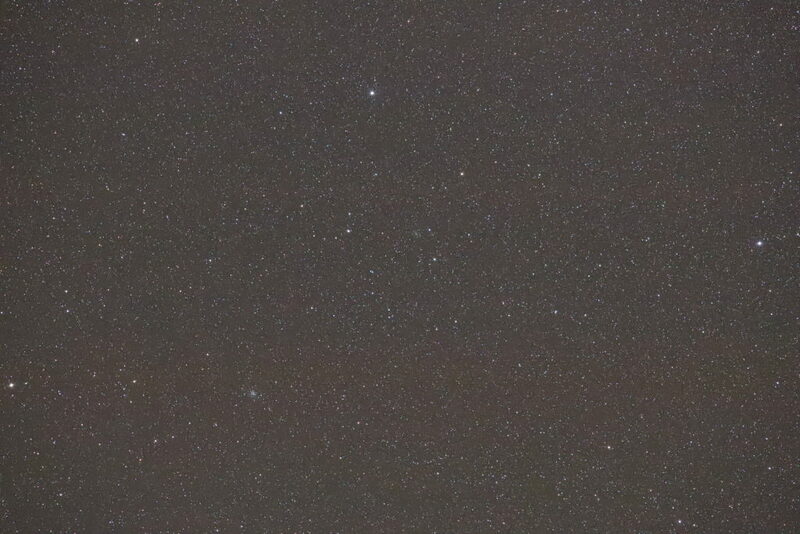 A single cropped image of 1min, 6400 ISO at f/4.5 with no processing can be seen below. NGC 7217 – This tiny spiral galaxy in Pegasus is extremely small, at 4 arc minutes across it would prove a challenge both to find and to see. At 21:45 I managed to find it in the binos then shortly after, which much nudging of the dob, in the 10”. It should be noted that this is a very, very faint in both instruments at mag +10.1. There was really nothing to note on shape and only really seen with AV. Stephan’s Quintet – NGC 7317/7318A/B/7319/7320 – I really tried hard to see this cluster of galaxies through the binos, however at 22:04 I gave up. 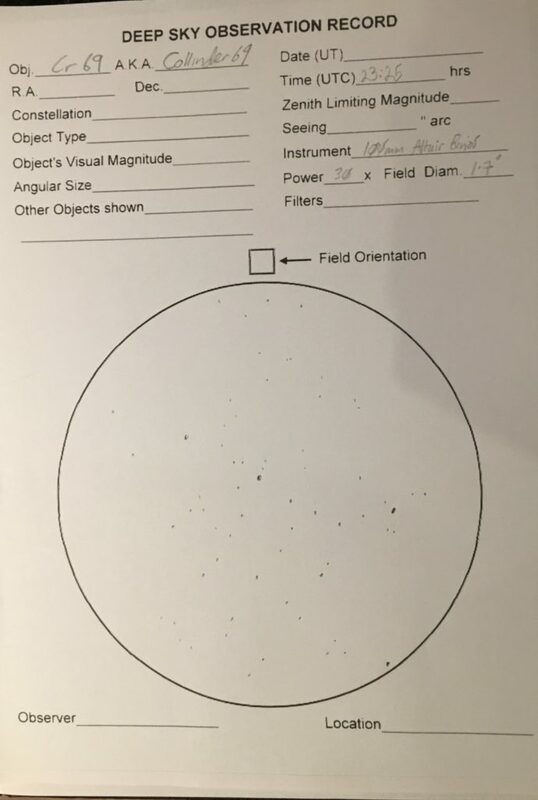 It is not surprising since they are +13 magnitude and although my binocular guidebook says they can be glimpsed as did a recent article on binocular objects in the American Astronomy magazine, clearly they need to remember just how fine this cluster is. NGC 7331 – On the plus side, whilst searching for Stephan’s Quintet I stumbled across this lovely galaxy which at 10×4 arc minutes was large enough and bright enough at +9.5 magnitude to see. You could tell it was an elliptical galaxy straight away and after the searching that went into the previous galaxy group I was happy to have found this by accident. NGC 7457 – Another galaxy not too far away from NGC 7331 and near the bright star Scheat (+2.47 mag) in Pegasus was found and could be seen with AV through the binos at 22:30. NGC 7479 – Near the bright main star Markab in Pegasus I found this small 4×3 arc minute spiral galaxy but only seen with AV through the binos. Given the trouble with movement of the mount of the 10″ dob I did not try to find it through that. On reflection, finding objects in the visual range of the binos, so up to +11.5 magnitude is relatively straight forwards. The APM wedge is a delight to use and the 4″ binos coupled with the 18mm eyepieces are divine. 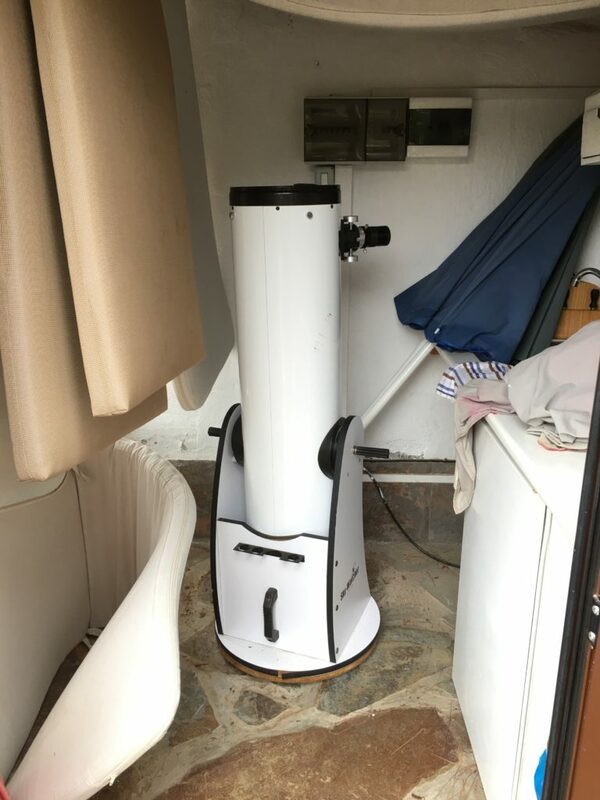 The 10″ Skywatcher on the other hand is stiff, jerky and provides a dim view even through the expensive and magnificent 24mm Panoptic eyepiece, which when coupled with my 12″ Officinal Stellare CDK back home provides a beautiful view. Tonights viewing came to end when Alan’s mount kept shorting out through water ingress into the EQ5 handset and my binos and the dob kept dewing up especially after all the rain we had during the day. Something to note when coming this time of year to the Canaries and this altitude. So we all know that comets are fickle things, promising a lot and delivering very little. So it was with a degree of scepticism that I thought that I would give Comet 38P/Stephan-Oterma a go. The article in Astronomy Now had explained that this periodic comet was making its first return for 38 years, arriving at perihelion on the 10th November with predicted magnitudes of between 9 and 10. Dave and I had looked for it with his massive bins, and whilst Dave was able to say that he could see it with averted vision, with honesty I couldn’t see it at all, and that was before a glass of vino! So as the mount was successfully aligned I thought that I would have a go at getting an image. Sky Safari indicated that it would be near to the star Wasat and 56 Gem. I had been using the 200 mm lens with the Canon 650 (mod) to image this evening at 800 iso, but thought that bearing in mind that the limiting magnitude for Dave’s binos was 11 that I was unlikely to get much at 800 iso. First try was centred on Wasat using 6400 iso. Accepting that it would be really noisy I thought that at least I would get something. There followed a series of shots, none of which were really definitive. I then tried creating a ‘user object’ on the handset, based on the Sky Safari coordinates. This again was inconclusive so with heavy heart I thought that 38P and given me the slip. It was therefore even more pleasing when examining the images on the computer the following morning to find a faint object on the images. Nothing spectacular, and Damian Peach will have no concerns about the completion, but there it was probably 10th magnitude a tiny fuzzy ball. First comet image for quite a time and pleasing to have seen this one as it flies into the Sun even if it was not a grand spectacle. 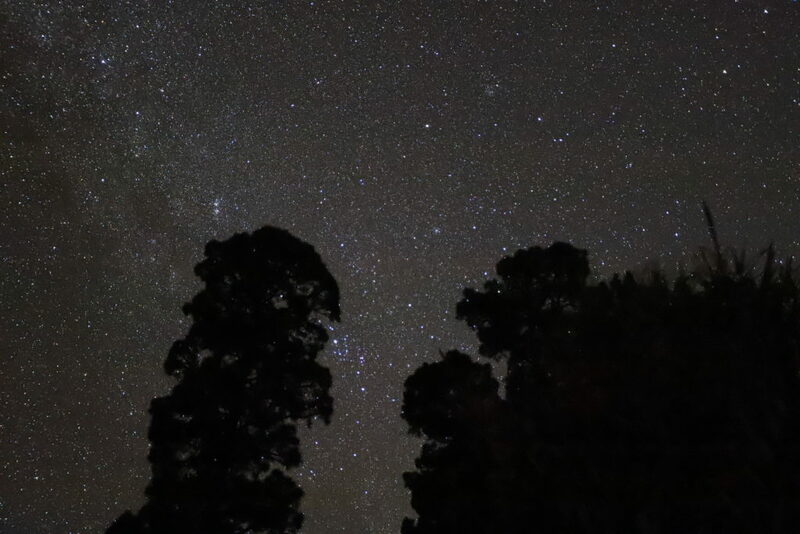 A good end to a hugely enjoyable evening under the La Palma stars. Tonight I decided to setup next to the pool area due to its height and ability to look over the rest of the site, affording great visibility both South and East. I dragged out the 10″ Skywatcher dobsonian telescope from inside the pool building and placed my own 24mm Panoptic eyepiece in it. 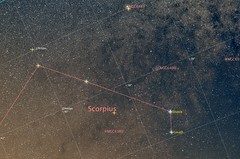 M11 – The first object this evening as I was the Wild Duck Cluster in Scutum at 21:54. 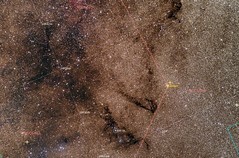 The central star was prominent along with 2 other stars to one side. There was a definite mass of stars packed in the centre, twinkling slightly as I gazed around. M27 – Next up was the Dumbbell in Vulpecula. This was such a bright object that I decided to draw it. 5-6 brighter stars could be seen and the central portion of the nebula looked almost rectangular to me with the fainter outer edges showing. The drawing took around 30mins to complete due to the time it takes to look through the eyepiece, look at the paper, look again through the eyepiece, look back at the paper, draw a star, then look back in the eyepiece and check the position. M31/M110/M32 – Another tour of these galaxies but this time with he 10″ since I had seen these through the 6″ Dob and 100mm binos recently. For M31 it was a very bright structure with a dark dust lane seen to one side. however no other detail was visible. M32 looked round and distinct. NGC 404 – At 23:49 I moved the scope to Mirach, a bright star in Andromeda. Mirach’s Ghost is an elliptical galaxy right next to the main star Mirach. It tends to be called a ghost as it has been assumed to be a bright spot potentially bouncing off the optics of a telescope. However, even though it comes and goes there it was seen directly. NGC 7640 – Alan and I both looked at this faint barred spiral just after midnight local time. Faint but definitely elliptical in shape, we both confirmed it’s existence however we could not see the magnitude +11 triangle of stars surrounding it. M45 – By 00:11 I moved the scope to view the Pleiades open cluster. Instantly you could see a bright halo of blue gas around each star. It was fairly obviously the reflection nebula in front of this cluster as other stars of similar magnitude did not display the halo effect. Alan and I both confirmed the blue reflection nebula across most if not all of the brighter members of the cluster. I could also make out the chain of 7th and 8th Mag stars from Sigma 450 and I could see the triangle of stars just West of Mag +2.9 Alcyone. M103 – Decided to take a look at M103, an open cluster in Cassiopeia at 00:47. Given the cluster has a visual magnitude of +7 it was in reality really dim, probably owing to the fact that it is only 16 arc minutes across. NGC 663 – To cheer myself up I moved almost next door to view this lovely open cluster. It was bright and sparkled in the night sky. NGC 654 – Next up was NGC 654 seen with averted vision the single bright star making it easy to find from 663. M42 / Running Man (NGC 1973-77-79) – By now it was 01:51 and I had setup the 100mm giant binoculars next to the 10″ Dob. Alan and I looked at M42 in the 10′ Dob and the trapezium was bright and clearly visible. The image was not the sharpest, maybe due to the optics of this reflector, maybe because we had the binos nearby which are a set of 4″ refractors. Through the binos the trapezium was smaller but sharper and the wider wings of M42 visible. The Running Man nebula adjacent to M42 was visible in the same field of view and looked like the photos we take. 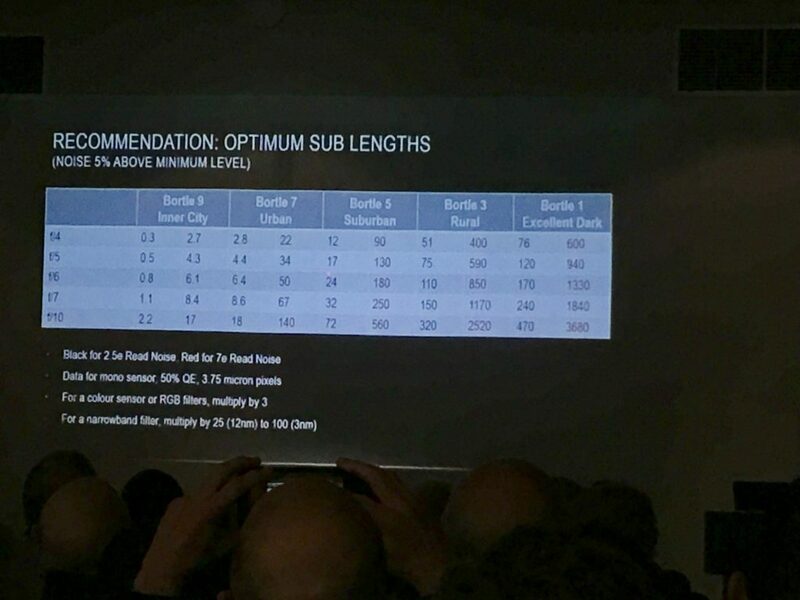 Through the 10″ is was much dimmer. 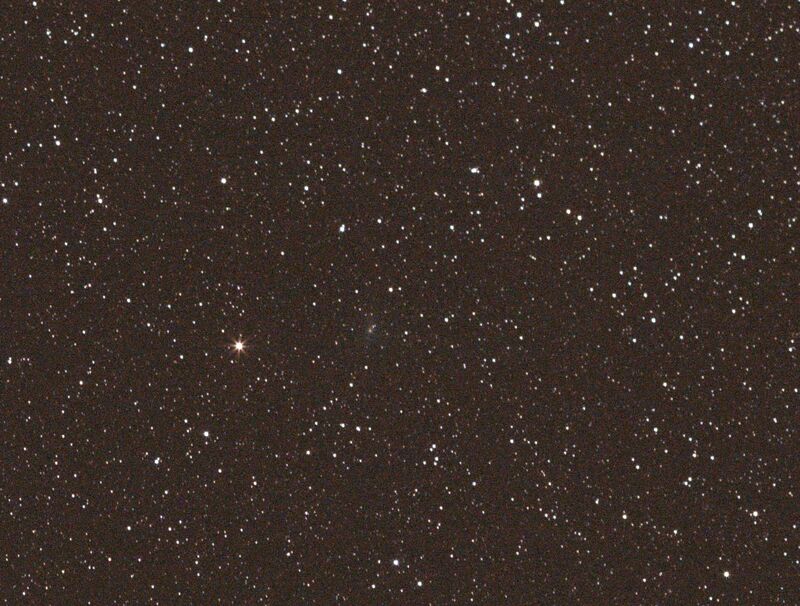 Comet 38P/Stephan-Oterma – Sitting in Gemini tonight, just NE of Pollux ( left most twin) the comet was found at 02:17 by myself, Alan could not confirm through the binos. I could only see with averted vision (AV). So this evening was a good visual viewing for me and for Alan, incidentally Alan was off imaging too some of the time so I await his processed results with great excitement. There was a lot of dew around this evening and I should have bought a humidity sensor with me to record just how much. Since the weather at 4,335 ft was cloudy with some precipitation Alan and I (Dave Shave-Wall) decided to take a trip up the mountain. The journey took around 30mins from our villa and we arrived at the new visitor centre first due to the route we took up the mountain. The centre is not finished yet even though it has been some 2.5 years being built. It’s an impressive set of buildings and has what seems to be at first glance 5 astrophotography pads with power. We then continued the short distance to the observatories and noticed the new member of the Magic family Magic III. This is a further telescope aimed at recording Cherenkov radiation. A little drive further and we arrived at Roque de los Muchachos. We took the obligatory sunset images as well as photos of the southern part of the island buried under blankets of cloud making several high points look like islands amidst the condensed water. By now we were frozen due to the high winds that always occur at the very top, so we descended, stopping briefly at the GTC for more photos and then on back to the unfinished visitors centre where we would setup for the evening. At 19:30 I took a look at Mercury through the 100mm giant Altair binoculars as it set within the blood red sky. Alan noted that the other point of light nearby and setting was in fact Antares, of course this time of year it sets early, so very different from our July trip this year when it was very much higher in the sky most of the night. Alan then moved the binos to Saturn which showed the ringed planets very crips and clearly with Titan at 11 o’clock and set within a star studded field. Next, whilst Alan was imaging the top of the Teapot, I set about drawing M7. This was my first ever drawing, so choosing an open cluster was fairly straightforward. It took me a little under 30mins, much longer than I imagined. The following day I would find I had recorded it very well indeed seeing down to mag +11. I then moved to NGC 188, an open cluster in Cepheus. I noted I could see it just about with direct vision (DV) however I found it more apparent with averted vision (AV), thus it was very faint. Finally I moved on to NGC 6939 an open cluster in Cepheus (my chosen constellation this evening) and nearby and in the same field of view NGC 6946, also know as the Fireworks Galaxy close to 2 prominent stars. Now whilst in photos the Fireworks Galaxy is spectacular, in the binos it can only be seen with AV and if you know what you are looking at (or not) then you can imagine the galaxy as it is seen in photography. 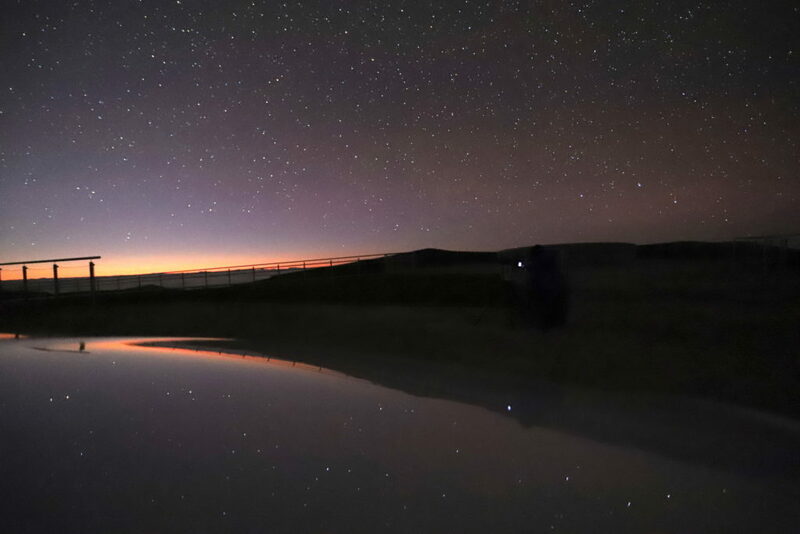 Next I grabbed the 6D MkII and started to take some skyscape photos over the top of a glass roof lantern for the centre, but soon after, even though Alan was still imaging I became cold due to so often the case, not enough layers and so packed up and sat in the car. By 9pm we were heading the 30mins back down to our villa for dinner and wine. It would not be until 6:30am for me to venture back out from my warm bed to try and hunt down the comet 38p. However after much noise, maybe waking Alan as I tried to get the binos setup outside my bedroom on the patio, I for the life of me could not see the comet. Within 15mins the rising Sun ruined my view and I retired once again back to bed until 10am. The comet would have to wait until tomorrow. Tonight was the first night in La Palma for this expedition. Alan and I setup outside round the side of the property on the path. The weather was warm to start with at around 20 degrees celsius and then cooling later in the evening to around 17 degrees. Alan setup his EQ5, Williams Optics 71mm f/5.9 with his Canon 650D and started the process of polar alignment. Meanwhile I (Dave Shave-Wall) setup the giant binoculars from Altair, 100mm with the 18mm eyepieces giving a 1.7 degree FoV. I also put back together after the flight, the 6″ Skywatcher dobsonian (still unhappy that there was already a 10″ here) and placed this nearby. I then grabbed my new Canon 6D MkII camera with fellow expedition member (not with us this trip) Bob Trevan’s 17-40mm lens. 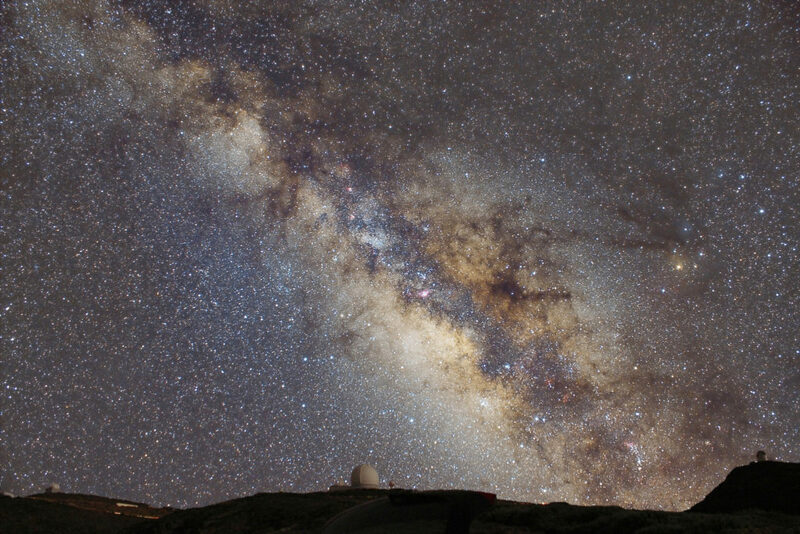 As the darkness settled in so the Milky Way came out in all it’s glory even though we are nearly half the height from our usual viewing both here and in Tenerife. I noted that the sky was indeed significantly darker than Tenerife and made a mental note to remind myself of that since our last visit to this island was 2015. By 22:21 I was ready to start observing. We had problems with the lights around the property not going off, finally by flicking all the trip switches off in the pool house I managed to get the lights off apart from the red glow next to the fountain. Tonight was looking really at binocular objects in Andromeda and working my way through those mentioned in the two great books I bought with me, namely The Night Sky Observers Guide Volume 1 and Touring the University through Binoculars. Double Cluster – Looking at the Double cluster in Perseus and I can see colour in both clusters. 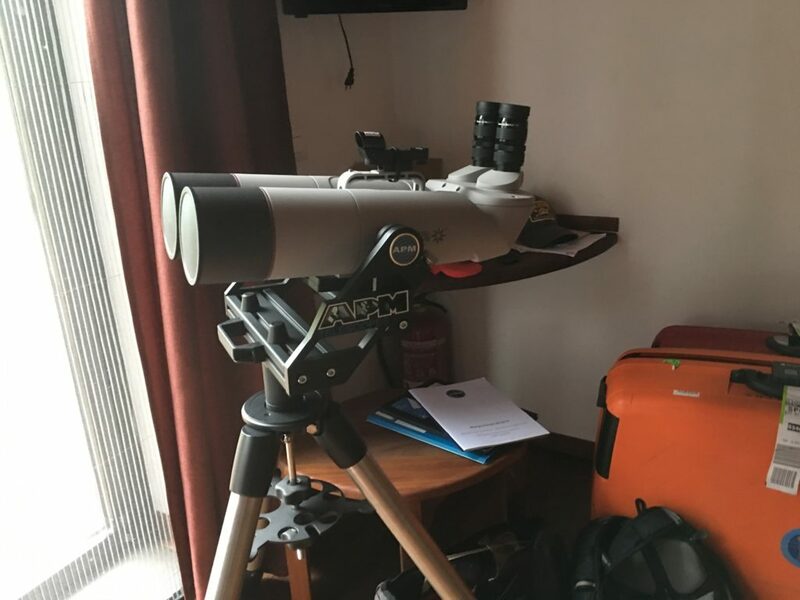 Looking at chi Persei (the more Eastern of the two clusters) there is a variable star RS Persei which has orange hue to it as seen with 18mm lenses on the 100mm giant Binos. M31 – In the binos this is very bright and stretches out across the field of view and beyond. Faint structure can be seen within the galaxy itself although I failed to be able to see any emission nebula within, which is not surprising given these are only 4″. Looking at M31 through the 6″ Dob with the 24mm Panoptic the view was dimmer, less contrast, the sky looked blacker but the stars and galaxy less pronounced. Clearly the FoV was smaller but the view through the Binos for this object wins hands down. The best view I had was several weeks ago through the 24″ Dob on Tenerife with Bob Trevan and I could make out the emission nebula easily. M32 – Looked very dim through the binoculars but was there in it’s almost round form. M110 – Very bright and stood out almost as much as M31. Elliptical in shape but showing no real detail. 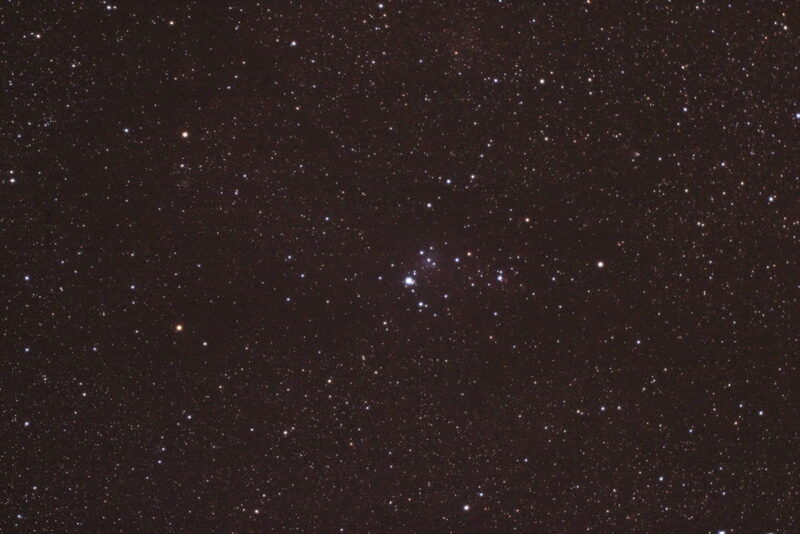 NGC 752 This Open Cluster was seen @ 22:42 and again @ 23:15 and also seen through the the 6” Dob to compare. The cluster was easy to find star hoping from Almach the Mag 2.1 star also known as Gamma 1 Andromedae. The cluster nearly fills the filed of view on the Binos with various bright components. I could make out the trio of stars to the East and the string of stars underneath it. There were also a bright pair of stars to the North West. Through the 6″ Dob the cluster was dimmer and the outer edges of the cluster were outside the FoV. 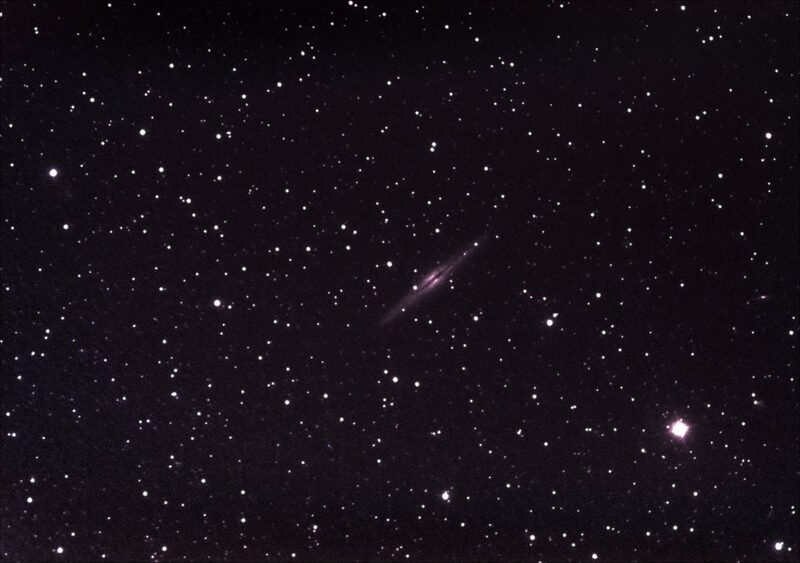 NGC 891 – @23:46 with averted vision (AV) I could see NGC 891 a pencil thin edge on barred spiral galaxy. As expected it was barely visible through the Binos and I did not attempt to find in the 6″. 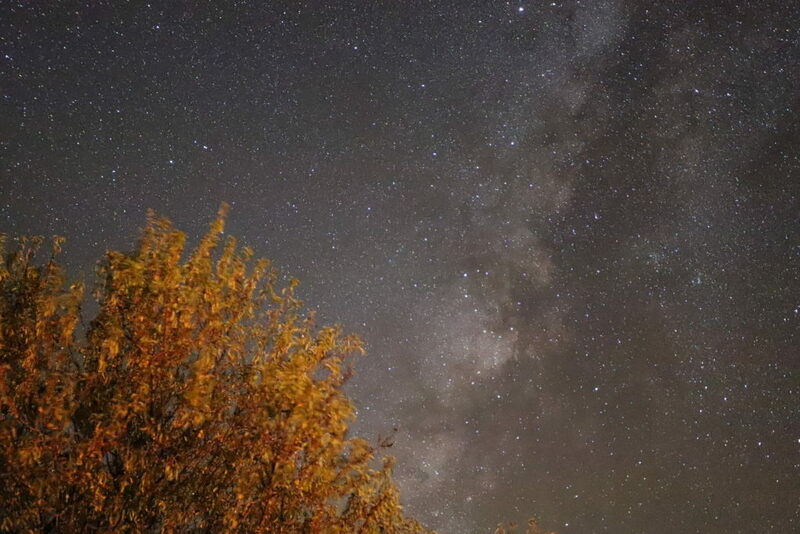 Below is a photo from Mike (Sky Badger) of this galaxy. 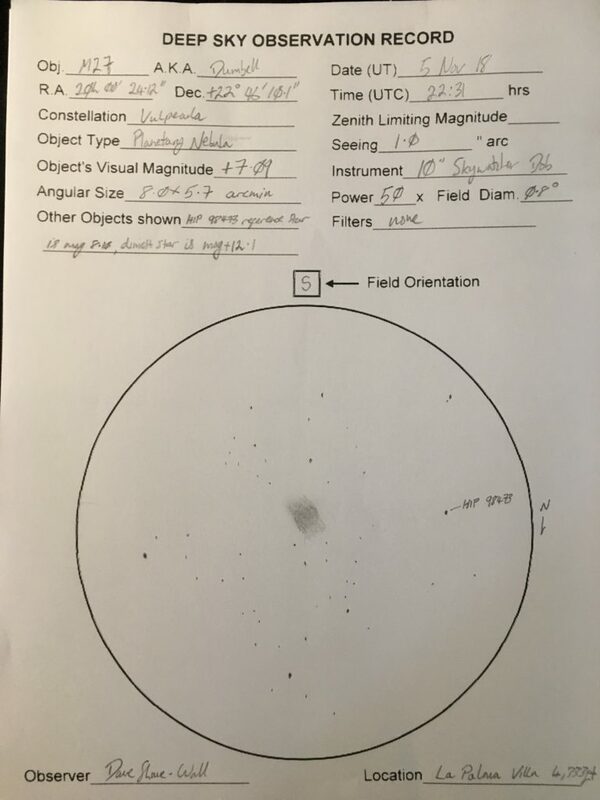 NGC 7686 – @00:02 I looked at NGC 7686 the tiny open cluster which you would not know even if you stumbled across it in the Binos. It took a while to find and I confirmed the cluster comparing the star pattern with a few choice bright stars with those in SkySafari Pro 4 on my iPhone. Algol – At Alan’s request around 00:17 we checked Algol against gamma Andromeda, so Almach as both are indeed +2.1, this was in planning for the eclipse of the Algol binary system later next week that I wish to observe. 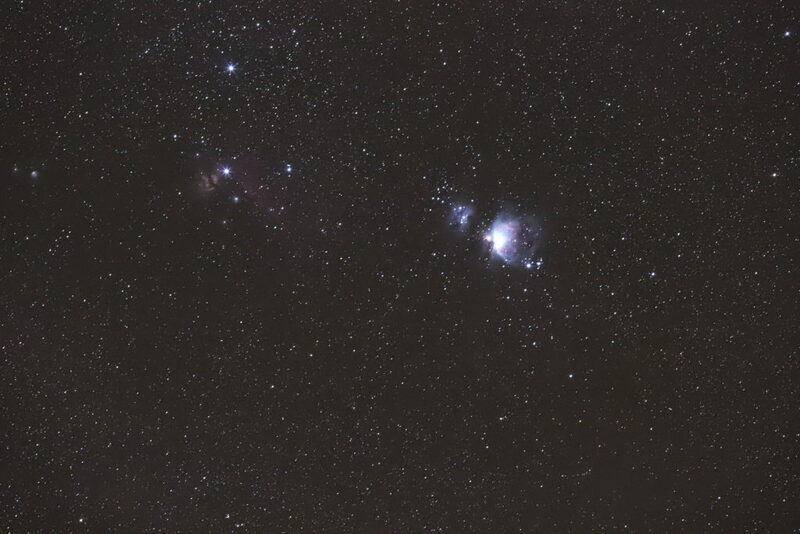 M42 – As Orion rose after 00:30 we observed the Great Orion nebula and the running man nebula through Binos and 6”. Spectacular through the binos for sure, and different details seen in the 6″. The running man could be seen in the same FoV through the Binos. Overall a successful night, as we were very tired by 2am after being up some 24 hours we headed off to bed. For Alan the night was frustrating as his polar alignment never really worked and other equipment challenges forced him to give up and do visual with me. The Canon 6D MkII had a good run and included here are some initial photos straight of the camera.